Ilayaraja who was basically a guitarist has done so many wonders with the western music instrument and with that he has proved is wizardry in the western music form. The earliest display of Western music expertise of Raja comes in the popular Senthoora Poove song in 16 vyathinile (1977). Here goes a sneak peak of the songs in which the Isaignani has given us superlative experience with songs and interludes that have Guitar as the center point. All the songs in this compilation not only have guitar as an instrument played through out the song as one of the instruments. These songs have guitar having a separate space either in the form interludes or at the end of the song. 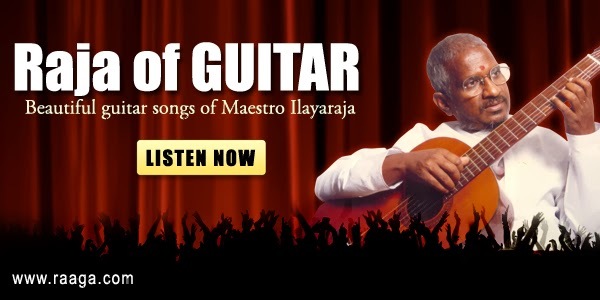 We cannot speak about the mastery of Ilayaraja’s Guitar and not include ‘Ilayanila of Payanangal’ Mudivadhillai. While hearing the song one cannot help imagining that Ilayaraja, S.P.Balasubramaniam (the singer) and Vairamuthu (Lyricist) are competing with each other to supersede the other’s performance. Music lovers will end up deciding Raja sir has won hands down mainly because of the exemplary guitar interludes that come between the charanams and at the end of the song. While in ‘En iniya Pon Nilave’ (Moodupani) the lead actor’s cheerful guitar playing is used to impress his lover in ‘Nalam Vaazha’) the same would have been used by the male character to soothe his girl in distress. These two songs stand testimony to Raja’s ability to convey two distinct emotions with the same instrument. Aasai Adhigam Vechu (Marupadiyum) is one of the best examples for Raja’s brilliance in using a western instrument for folk kind of song. En Jodi Manjakuruvi (Vikram) is another song that is different altogether having Guitar at the forefront. And let’s not forget to mention Meendum Meendum Va from the same, where guitar is also used to express yearning of love. The best way to end this would be to pay due respets to Mr.Sadhanandhan, Mr.Chandrasekar, Mr.Radha Vijayana and Mr.David Jayakumar (Father of Harris Jayaraj) for these are some of the guitarists who took part in the magic created by Raja in the 80’s.